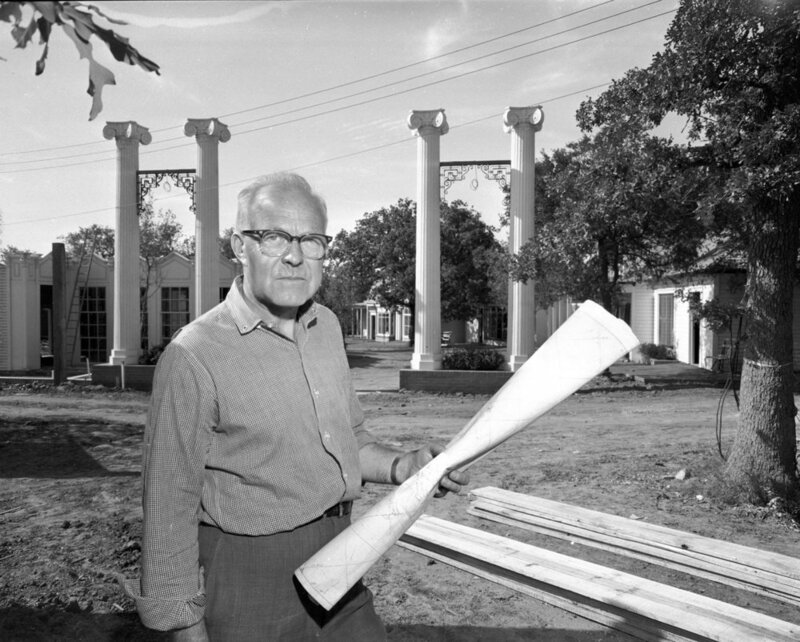 Angus G. Wynne, Jr. has the desire of building Six Flags Over Texas after being inspired by the opening of Disneyland four years earlier. The Great Southwest Corporation begins planning and designing for Six Flags Over Texas. The name "Six Flags" is represented and thought up from the six different countries whose flag has flown over Texas. 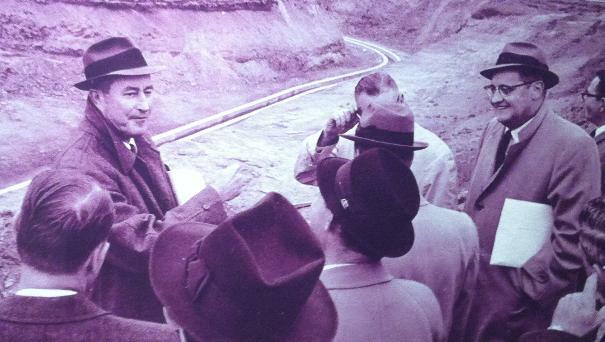 The construction of Six Flags Over Texas begins. 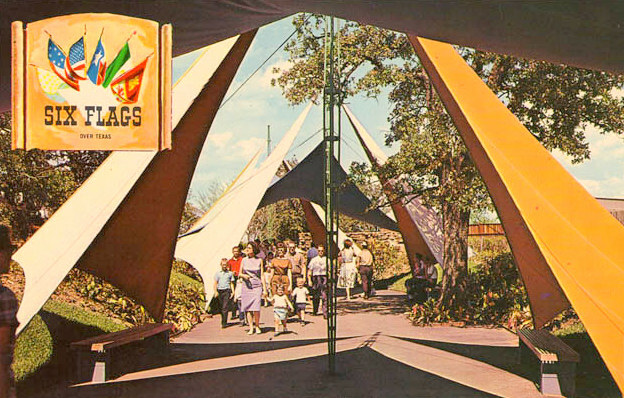 Six Flags Over Texas officially opens on August 5, 1961. Attendance for the first opening day is 8,374 people. Admission Price is $2.75 for adults and $2.25 for children, parking is 50 cents, hamburgers are 35 cents, and soft drinks are 10 cents. Minimum employee age is 21 years old. The first six areas of the park are Spain, France, Mexico, Texas, Confederacy, and Modern (USA). Located at the front gate are the dancing waters, the Star Mall, and the Six Flags Over Texas marching band. In the Modern section of the park, attractions include the Southwest Life Petting Zoo, Missile Chaser, Happy Motoring Freeway (One Track), Astro-Lift, and the Sidewinder, a wild mouse roller coaster. La Salle's River Boat Adventure attraction is located in the France section of the park. The Amphitheater, the Butterfield Stage Coach, the Little Dixie Carousel, the Dixieland Band, and the Confederate recruiting station and re-enactment performers are located in the Confederacy section of the park. Skull Island, "Skull Rock" skull slide, Raft Ride to Skull Island, and Tree Slide are located in the Skull Island/Confederate area of the park. The Six Flags Railroad, Astro-lift Terminal, and Gunfighter Performances are located in the Texas section of the park. The Los Conquistadors Coronado Burro Ride is located in the Spain section of the park. The Las Cocheses Cabras Goat Cart Ride, the Indian Village, the Indian Dancers, the original Ferrocarril Fiesta Train, the Mexican Band, and Banderas de Colores (Covered walkway) are located in the Mexico section of the park. Helicopter Rides are located outside the park. The first season was a total of 45 days in operation, 550,000 total attendance throughout the first year, and the last operating day was November 25. 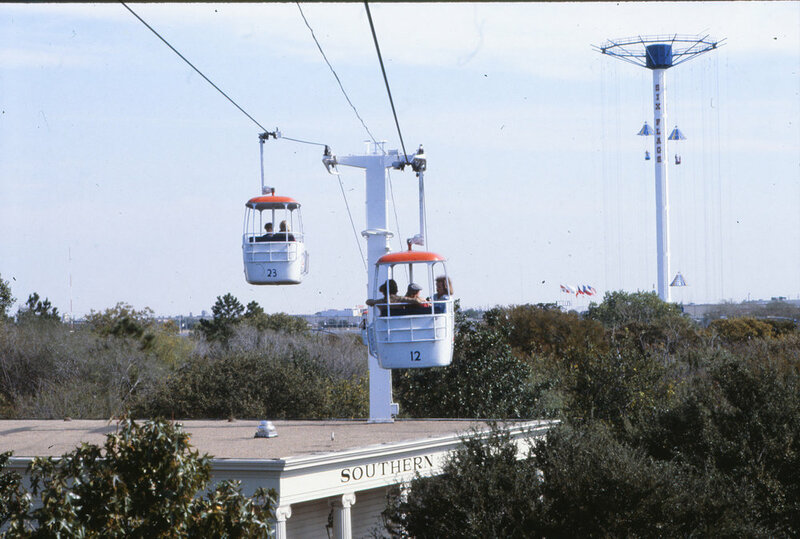 Adult tickets are $2.75, tickets for children under 12 are $2.25, the operating season begins on April 20th, 1962, minimum employee age is 18, and Six Flags Over Texas sports 1,000 employees. The Wild Mouse roller coaster, Sidewinder, is moved to Mexico and renamed La Cucaracha. The red train is added to the Six Flags Over Texas Railroad. Chaparral Antique Cars are added in the Texas area of the park. The Caddo War Canoes attraction is added to the Confederacy section of the park. Skull Island is expanded and new attractions that are added include a Tree House Slide, Barrel Slide, and Pirate Ship. A second track is added to the Happy Motoring Freeway, taking the old spot where Sidewinder once sat. The Casa Magnetica, which is a "crooked house" attraction, is added to the Spain section of the park. The Los Conquistadors Coronado Burro Ride is removed from the park at the end of the operating season. End-of-year attendance is at 1.2 million people. Adult tickets are $3.50, tickets for children under 12 are $2.50. Boomtown is added to Six Flags Over Texas as the seventh area. Boomtown attractions include the Antique Carousel, The Sky Hook ride, and the Boomtown train station. El Aserradero, a log flume attraction, is added in the Spain section where the Lost Conquistadors Coronado Burro Ride once existed. 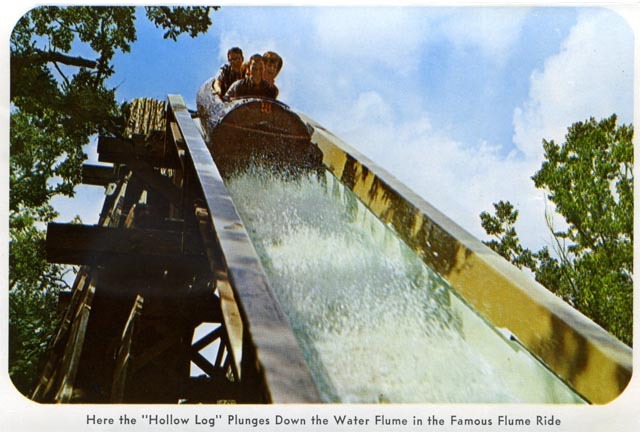 El Aserradero is the first log flume in the world. Track number 1 on the Happy Motoring Freeway is shortened for the Boomtown section of the park. The Goat Cart ride is removed from the park at the end of the operating season. 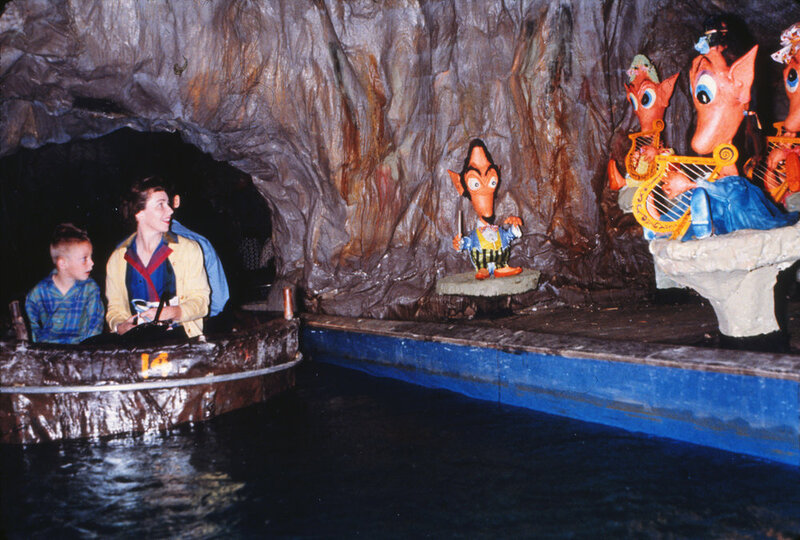 The Spee-Lunkers Cave Ride is added to the Confederacy section of the park. A suspension bridge and three Swamp Slides are added to Skull Island. The Caddo War Canoes attraction is moved to the Boomtown area of the park. The park's first roller coaster, La Cucaracha, the Indian Village, and the Pirate Ship in Skull Island are removed from the park at the end of the season. El Sombrero is one of the oldest attractions at Six Flags Over Texas. A Chance Trabant attraction, El Sombrero, is added in the Spain area where the La Cucaracha roller coaster once existed. An arena is constructed in the Texas area of the park. A Circus Show is hosted in the arena, but only for the 1965 season. The "Star" is removed from the front gate and is replaced with five large circular planters. The Runaway Mine Train roller coaster is added to the Boomtown section of the park. A Wild West Show is hosted in the arena located in the Texas section of the park. A Chance rotor ride, Spindletop, is added to the park. 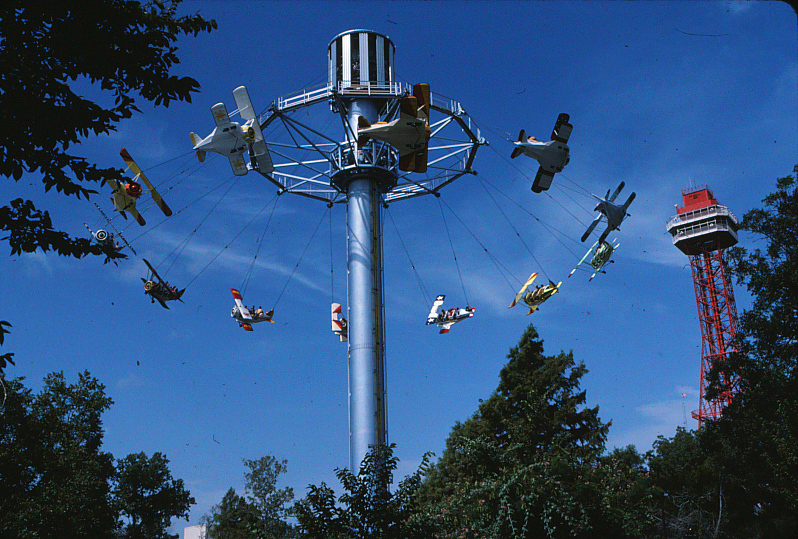 Jet Set rides are added to the Modern area of the park. The original Fiesta Train is removed from the park. End-of-year attendance is reported at around 2 million people. The Butterfield Stagecoach attraction is removed from the park at the end of the season. Fiesta Train II is added in place of the original Fiesta Train in the Spain section of the park. Spindletop is moved between the Southern Palace and Skull Island. The ampitheater is constructed into a 950-seat indoor venue and renamed the Southern Palace. A second flume is added to El Aserradero due to its popularity. The Krofft Puppet Theatre is added just outside the Modern section of the park. The Sky Hook attraction, along with the suspension bridge and three Swamp Tree Slides from Skull Island, are removed at the end of the season. Attendance declined for the first time in park history from 2 million to 1.7 million for end-of-year attendance. Six Flags is sold by Angus G. Wynne, Jr. to Limited Partnership, which is headed by Jack Knox. Oil Derrick, a 300-foot-tall Intamin observation tower, is added in the Tower area of the park where the Swamp Tree Slides and suspension bridge once existed. A Tower Slide attraction, which was a 12-lane slide, is attached to the Oil Derrick at the 50-foot level. 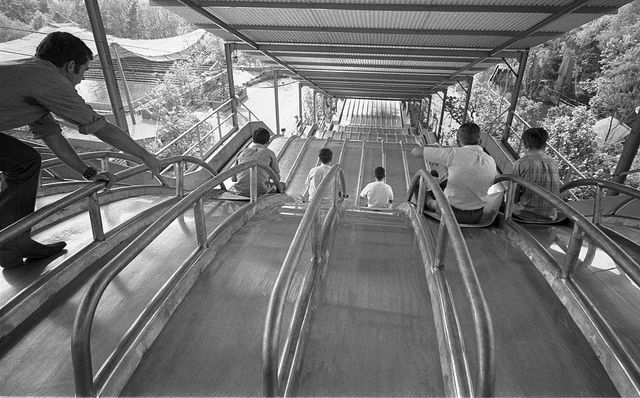 Riders would travel down the slide on burlap sacks. The Mini Mine Train is added to the Boomtown area of the park where the Sky Hook attraction once existed. The Dolphin Show is added to the Tower section of the park near Oil Derrick. The Cinsephere Chevy Show is added in the Confederacy area of the park where the Butterfield Stagecoach attraction once existed. At the end of the season, the Wild West Show ends at the park. Texas Arena is remodeled and a new show called Las Voladores Flying Indian Spectacular is added. The Jet Set ride attraction is removed from the park at the end of the season. Penn Central Railroad begins management of Six Flags Over Texas. Big Bend, a Schwarzkopf Speedracer steel roller coaster, is added to the USA (Modern) section of the park. 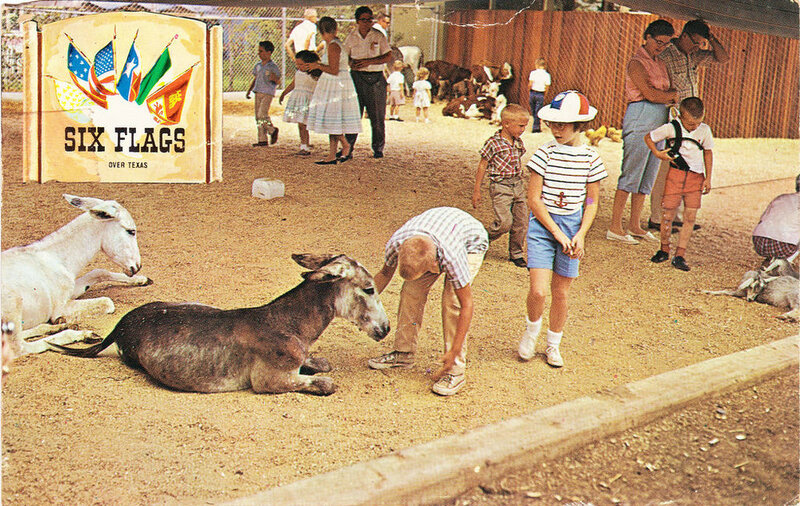 The Rugged Buggy attraction is added to the Petting Zoo in the Modern area of the park. The Boomtown Railroad Station is demolished at the end of the operating season. Good Time Square, the park's eighth themed area, opens to the public. This is the first park area to feature games of skill. 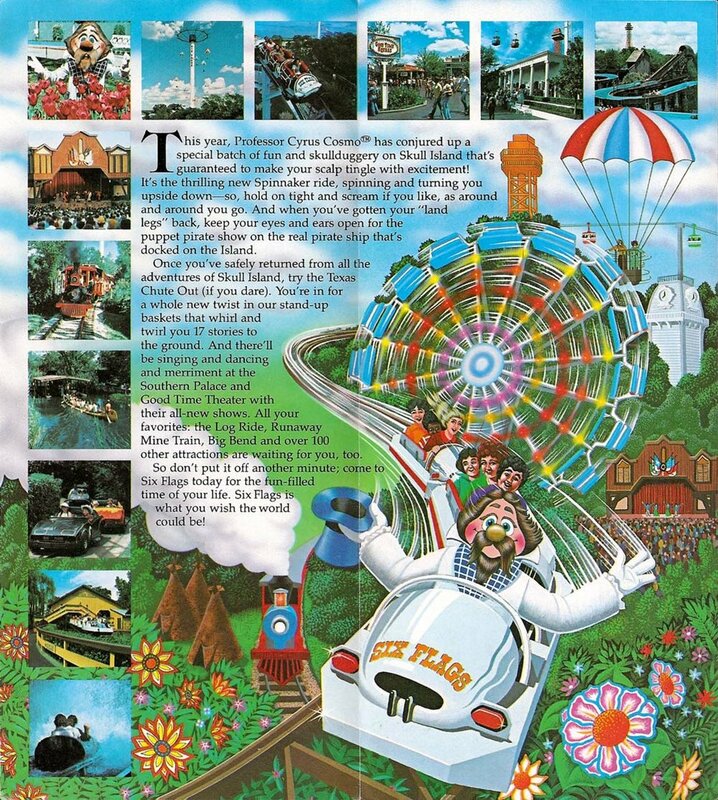 Good Time Square attractions include, Doc Snooker's Infernal Electric Bumping Machines (Bumper Cars), Crazy Legs (Octopus-Type Ride), a Miniature Circus Exhibit, and the Good Time Square Railroad Depot. Attendance record of 40,742 people takes place on May 19, 1973. The Music Mill Amphitheater is added to the park with 4,500 seats. At the end of the season, the Arena in Texas is removed, the Flying Indian Spectacular is removed, and the Flying Jenny attraction is also removed. The season begins on March 15, 1975 with adult tickets at $7, tickets for children under 12 are $6, and children under 3 are free. A new mascot is introduced for Six Flags Over Texas. His name is Cyrus Cosmo, the inventor. His Incredible Electric Light Brigade Parade is featured. Red Baron is added to the Confederacy area where Flying Jenny once existed. 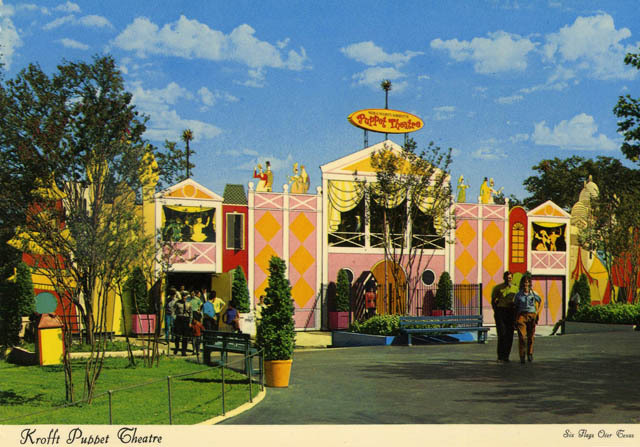 The Small Theater show is changed from Will Rogers to The Fun Guns of Dry Gulch. 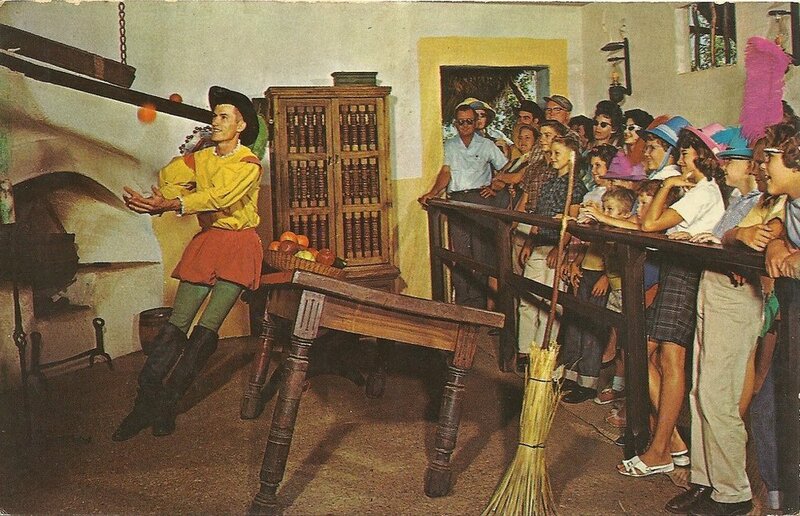 The attraction Rotoriculus (to later be named Roto Disco), which is a Cyrus Comos invention, is added to the Goodtimes Square section of the park. The Small Theater and the Sid & Marty Krofft show are removed at the end of the season. 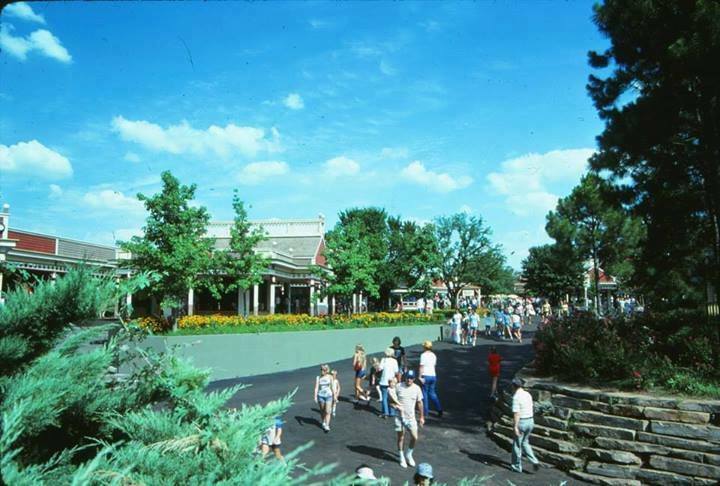 The end of the season is November 30, 1975 and 2.7 million people are shown to have visited the park all year. The average daily attendance is shown at 15,000 people. The season starts on March 13, 1976 with tickets at $7.50 and children under 3 free. Season passes are introduced at $25.00. The Intamin Parachute Drop attraction, Texas Chute Out, is added to the Goodtimes Square section of the park. At the end of the year, the Tower Slide, along with the Skull Island Rafts, are removed from the park. The season ends on November 28, 1976. Spinnaker, a Schwarzkopf Enterprise attraction, is added to the to the Tower section of the park. Stand up baskets are added to the Texas Chute Out. The Pirate Puppet Show is added to Skull Island. At the end of the season, Missile Chaser is removed from the park. On July 3, 1977, a record-breaking crowd is reported at 45,496 people. This is the same day K. C. and the Sunshine Band performs at the park. Tickets are at $8.50 and children under 3 are free. 32 million total guests are on record since the park's opening season. A Schwarzkopf multi-looping steel roller coaster attraction, Shock Wave, is added to the Tower section of the park. 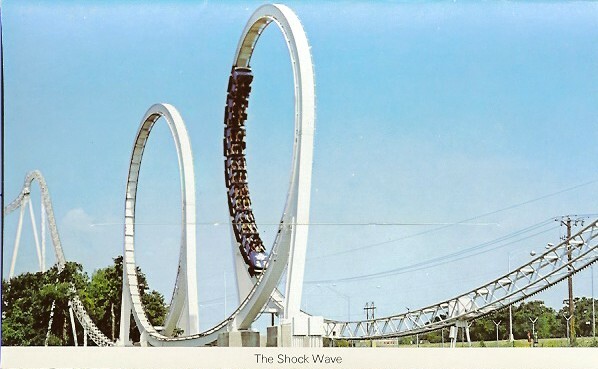 Shock Wave was coined as the tallest, longest, fastest double loop coaster in the world when it opened. At the end of the season, the skull is removed from Skull Island and Fiesta Train II is removed from the park. A record attendance of 2.78 million people in one year is recorded. Average yearly attendance is at 2.5 million people. The attraction Sensational Sense Machine is added to the USA (Modern) section of the park where Missile Chaser once existed. The People Mover Man, a new show, is added to the Mexico section of the park. 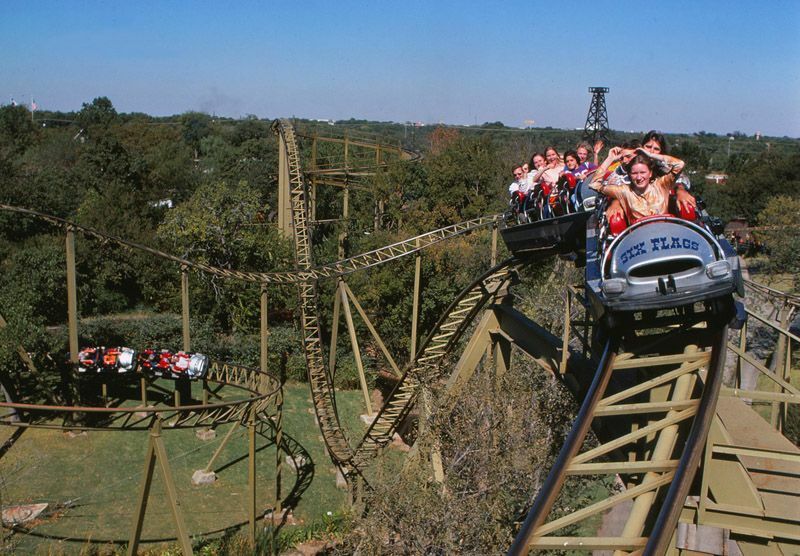 At the end of the season, the Big Bend roller coaster is removed from the park, sent to Six Flags St. Louis, and stored until the late 1980s. Big Bend is eventually sold for scrap. Banderas de Colores (covered walkway) is removed from the Mexico section of the park. Angus G. Wynne, Jr., the creator of Six Flags Over Texas, passes away at the age of 65. Judge Roy Scream, a wooden out-and-back roller coaster designed by Bill Cobb, is added to the Good Time Square section of the park. Track 1 of the Happy Motoring Freeway is removed. Astro-Lift, Crazy Legs, and the Miniature Circus Exhibit is removed from the park at the end of the season. 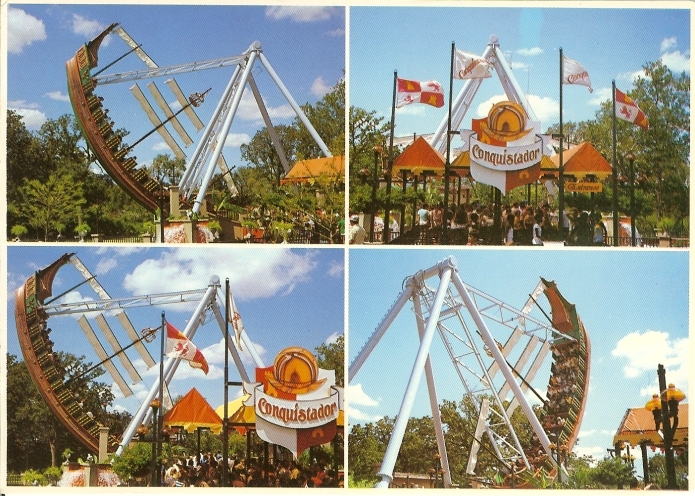 Conquistador, a Swinging Ship attraction, is added to the Spain section of the park. The Kiddie Ferris Wheel is added in the Tower section near Oil Derrick. Penn Central sells Six Flags Corporation. Bally Manufacturing Corporation then buys Six Flags Corporation. Texas Cliffhanger, a first-generation Intamin Freefall attraction, is added to the Boomtown section of the park. LaSalle's River Adventure closes on August 15, 1982 and is removed from the park. At the end of the season, the Petting Zoo is removed from the park, along with the last of Skull Island and the Pirate Puppet Show. Spindletop is moved to the Texas section of the park. Roaring Rapids, an Intamin River Rapids attraction, is added into the Tower section of the park in the spot where Skull Island and LaSalle's River Adventure once existed. 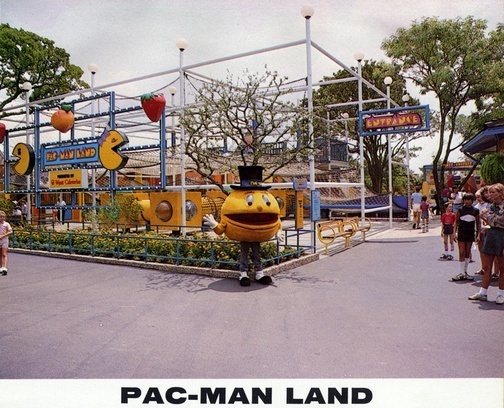 Pac-Man Land is added to the USA (Modern) section of the park where the Petting Zoo once existed. The Red Baron and Ferris Wheel attractions are moved to Pac-Man Land. Texas Tornado is added to the spot where Crazy Legs had once existed in Good Time Square. At the end of the season, the Caddo War Canoes are removed from the Boomtown section of the park and the Dolphins are removed from the Tower section of the park. The Great Six Flags Air Racer, a Bi-Plane Tower attraction, is added to the Tower section of the park. The US High Diving Show is added to the Tower section of the park in the pool where the dolphins had once performed. The first "Spring Break Out" takes place in the 1984 season. At the end of the year, Pac-Man Land is removed. Attendance for the season is recorded at 2.35 million people. Texas Chute Out once sported Holiday in the Park decor. Tickets are priced at $14.95 for adults and at $7.95 for children under 42". Pac-Man Land is rethemed into Looney Tunes Land in the USA (Modern) section of the park. Daffy Duck Boats are added, Red Baron is renamed Tazmanian Devil Flying Ace, and Rugged Bunny is renamed to Road Runner Runaround, all of these changes happening in Looney Tunes Land. Holiday In The Park is introduced with a total of 100,000 guests. The Antique Carousel is removed from Boomtown for restoration once the season ends. Tickets are at $14.95 for adults and $7.95 for guests under 42". The Avalanche Bobsled roller coaster is added to the Spain section of the park. The Avalanche Bobsled roller coaster came from Six Flags Magic Mountain. The Music Mill is expanded from 4,500 to 10,000 seats. The park celebrates its 25th anniversary on August 5, 1986 with a grand total of 52 million guests since the park opened. The Happy Motoring Freeway is removed from the park at the end of the season. Splashwater Falls is now themed as Aquaman Splashdown. Six Flags Corp. is bought by Wesray Capital Corp. for $617 million. 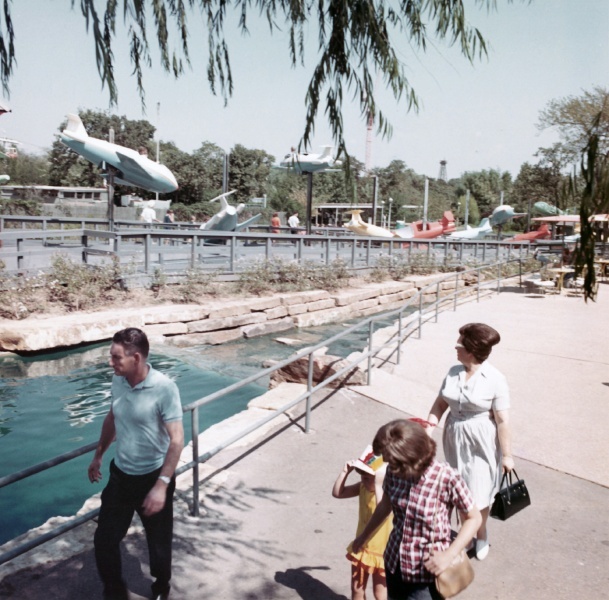 Splashwater Falls, a Hopkins Rides water attraction, is added to the area that was once home to a portion of the Happy Motoring Freeway. During summer the Incredible Acrobats of China perform in the Southern Palace Theatre. 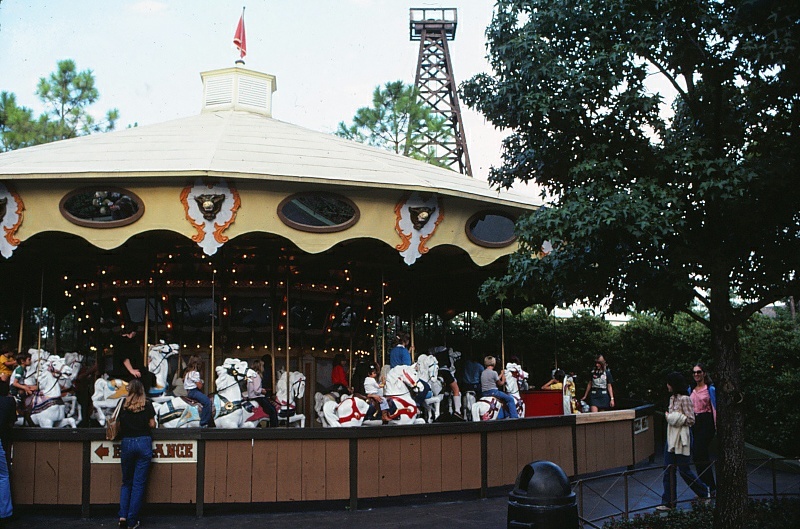 The carousel reopens at the front of the park as the Silver Star Carousel after being restored. 1988 is the final season for the US High Diving Show in the park's Tower section. The third largest crowd is reported on October 22, 1988, Fright Night, at an attendance of 45,000. At the end of the season, Rotoriculous is removed from Good Time Square. The US High Diving Show in the park's Tower section is also removed. Flashback! once occupied the current location of The Riddler Revenge. The park begins the season on March 4 with tickets at $20.50 for adults and $14 for children and seniors. Six Flags Over Texas begins referring to Good Time Square as Good Times. The whole area receives a 50s-themed makeover. Flashback!, a Boomerang roller coaster, is added to the Goodtimes Square section of the park. The Texas Tornado is moved to the former site of the Antique Carousel in Boomtown. The Dolphin Show returns for its second run in the Tower section of the park. The 1989 season ends December 31. 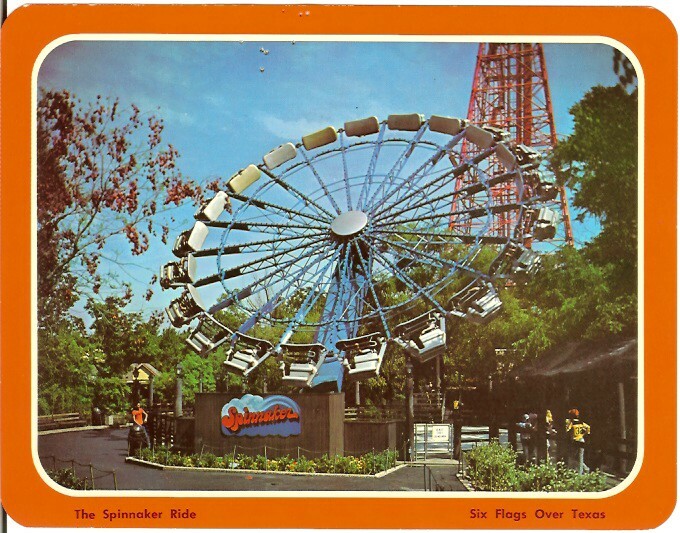 Spindletop is removed and relocated to Frontier City after the season ends. 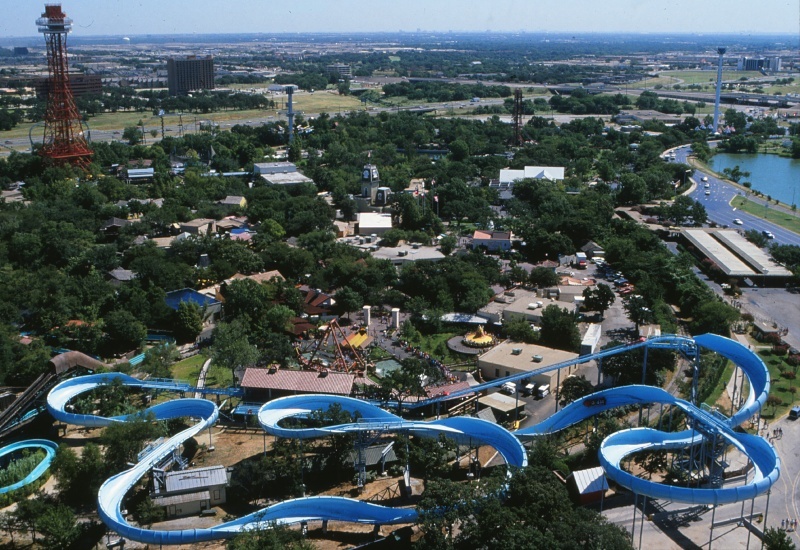 An aerial view of the original Texas Giant. The park's season begins on March 17. The Texas Giant, a wooden roller coaster designed by Curtis D. Summers, is added to the Texas section of the park for $5 million. It is the tallest and fastest wooden roller coaster in the world when it first opens. Over 3 million guests are recorded to make 1990 a record season. The 1990 season ends December 31. 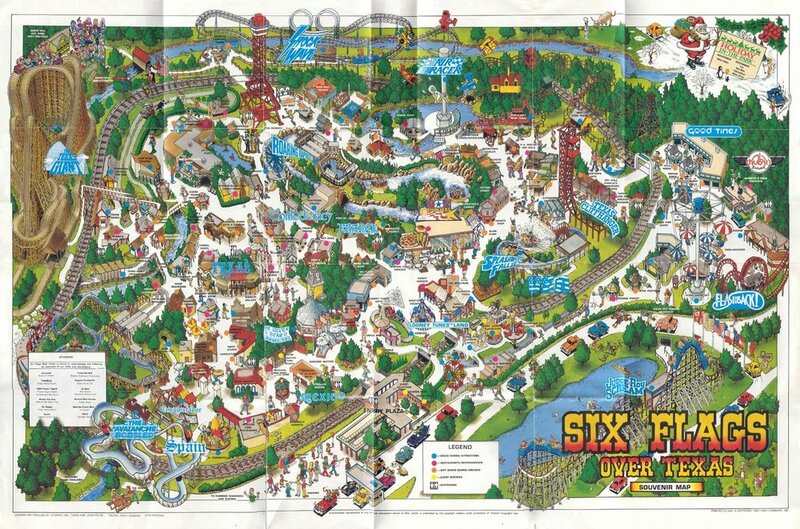 A look at the park's 1991 season map. Time Warner buys one-half of Six Flags Corp. while the Blackstone Group and Wertheim Schroder buy the other half. The Spee-Lunkers dark ride attraction is removed from the park's Texas section at the end of the season. Yosemite Sam & the Gold River Adventure during the 2016 season. Yosemite Sam and the Gold River Adventure is added to the spot that once held the Spee-Lunkers attraction. The Batman Stunt show is added to the site of the old Stunt Show and Dolphin Show in the Tower section of the park. Tickets for adults are at $25.95 and $19.95 for seniors and children. Time Warner buys the second half of Six Flags Corp. from the Blackstone Group and Wertheim Schroder. Adult tickets are sold at $26.95 and senior and children tickets are sold at $20.95. There are 2,500 seasonal employees along with 225 full-time employees. The Right Stuff: Mach One Adventure is added to the new Ulitmate Adventure Theater in the USA section of the park. Texas Cliffhanger, a 1st Generation Intamin Freefall, is renamed to G-Force. Splash Down Falls is renamed to Splash Water. Roaring Rapids is renamed LaSalle's River Rapids and the entrance to the attraction is moved from the Tower section to the France section. Chameleon Virtual Reality is added to the Goodtimes Square section of the park. 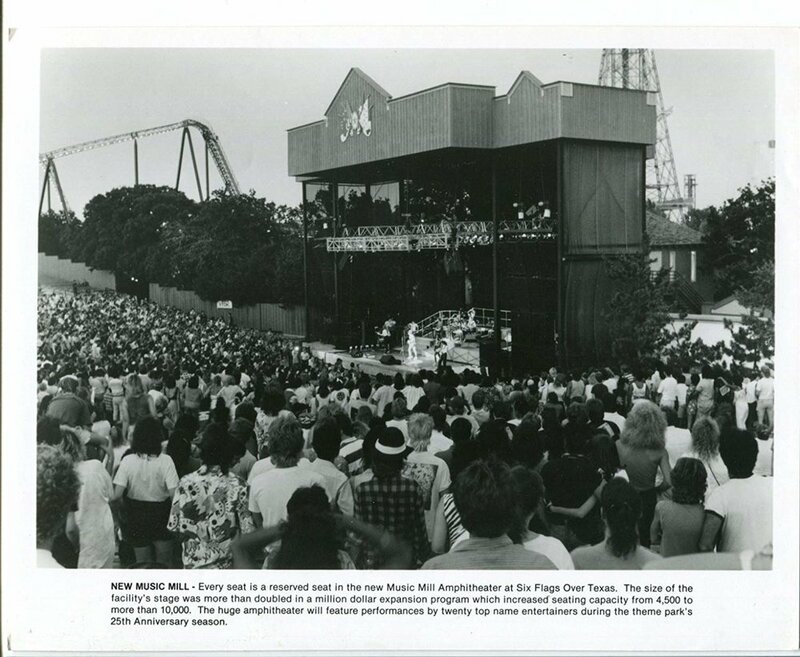 The Music Mill Amphitheater is expanded from 10,000 to 15,000 seats. Spinnaker is removed from the park at the end of the season. Runaway Mountain is a roller coaster in complete darkness. Runaway Mountain, a steel indoor roller coaster, is added to the Confederacy section where Spinnaker once stood. Dive Bomber Alley, a Skycoaster attraction, is added to the Tower section of the park. 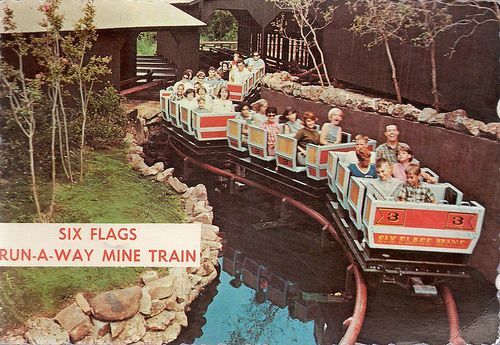 The Runaway Mine Train is renamed to Mine Train. The Good Time Square Train Station is removed at the end of the year. Remnants of the Goodtimes Square Train Station still exist at Boomtown Depot. A new train station, Boomtown Depot, is added to the Boomtown section of the park. The Confederacy section is officially renamed Old South according to the 1997 season park map. Mr. Freeze, a steel LIM launch roller coaster, is added to the park but does not operate during the season. At the end of the season, Elmer Fudd’s Little Ferris Wheel is removed from the park. Mr. Freeze, initially slated for a 1997 opening, opens in 1998. Premier Parks buys Six Flags, Inc.
Mr. Freeze officially opens to the public. Mini Mine Train opens after its track is reprofiled to fit the new Mr. Freeze roller coaster. LaSalle's River Rapids is renamed Roaring Rapids and the entrance to the attraction is moved back to the Tower area from the France area. The Right Stuff: Mach One Adventure is removed from Adventure Theater at the end of the season. Gotham City is the park's newest area. Gotham City, a new themed area, is added next to the Goodtimes Square section of the park. Batman: The Ride, an inverted roller coaster, is added to the new Gotham City section of the park. A new show is added to the Adventure Theater entitled Escape from Dino Island 3-D.
Six Flags Speedway, a go-carts attraction, is added to the Tower section of the park. 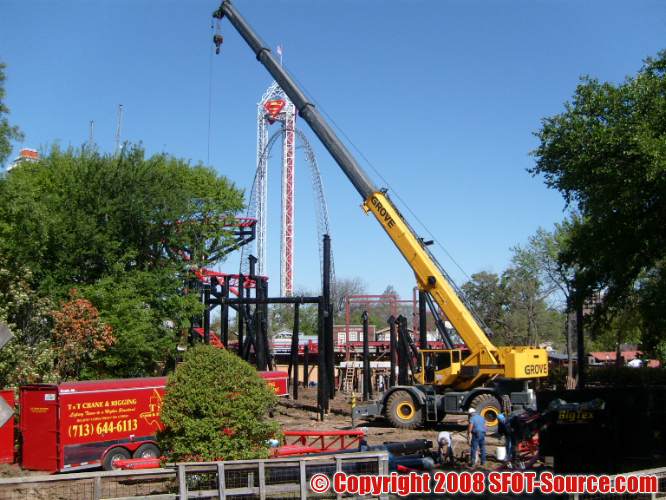 The Great Six Flags Air Racer attraction is removed from the Tower section of the park. 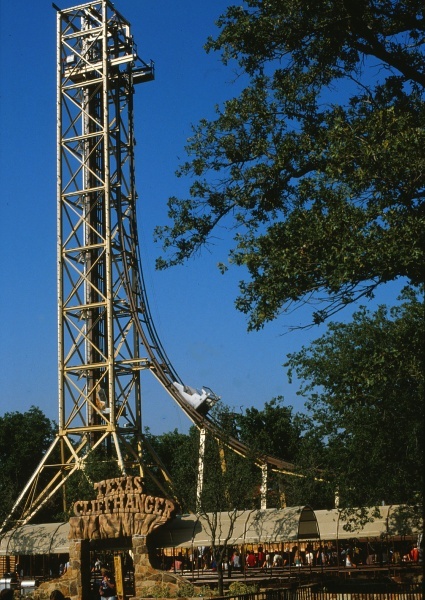 The Missile Chaser, an Eli Bridge Scrambler attraction, is brought back to the Tower section of the park where Air Racer once stood. The G-Force freefall attraction is renamed Wildcatter. Titan is the tallest roller coaster in Texas. Titan, a steel hypercoaster, opens in the Texas section of the park and was the largest roller coaster built by Six Flags, Inc. when it had first opened. Wile E. Coyote's Grand Canyon Blaster, a children's roller coaster, is added to the Looney Tunes USA section of the park. The Turbo Bungy attraction is added to the Gotham City area of the park. A map from the park's 2002 season. The Virtual Quest Interactive Theater is added at the beginning of the season. A new show entitled Space Shuttle America is added to Adventure Theater. Turbo Bungy is moved from Gotham City to the Tower area by Shock Wave. At the end of the season, the Missile Chaser attraction is removed from the Tower area. When opened, Superman: Tower of Power was the tallest ride of its kind in America. Admission for the season is at $39.99. Superman: Tower of Power, a S&S Combo Tower attraction, is added in the spot that the Missile Chaser had once existed in and is the tallest of its kind in America. The Right Stuff: Mach One Adventure returns to the Adventure Theater, taking the place of Space Shuttle America. At the end of the season, the Virtual Quest Interactive Theater is removed from the park. Spongebob Squarepants 4-D comes to Adventure Theater and replaces The Right Stuff: Mach One Adventure in the USA section of the park. After closing in the early 90s and only opening just a few times after that, Casa Magnetica, a crooked house attraction, is reopened full-time. Skull Duggery was a brand new haunted house on the island at the center of Roaring Rapids. The park season begins on March 5 with admission at $41.99 for adults, $26.99 for children under 48" and seniors, and children under 2 are free. Daily parking is at $9. "World Class Entertainment" is unveiled for the summer and includes the three shows, Kathy Burks' World of Puppets, The Amazing Acrobats of China, and Spirit of The Dance. Six Flags, Inc. is put up for auction. Two new haunted houses are introduced for Fright Fest and they are Skull Duggery, The Haunting of Skull Island and Boomtown House of Wax. Six Flags Over Texas announces the largest expansion in the park's history for the 2006 season. Ten new attractions will be coming to the park for the 45th anniversary. Dan Snyder purchases enough stock to take over Six Flags Inc. and names Mark Shapiro as the new CEO. He also replaces other board spots and closes the auction of the company. Holiday In The Park prices start at $31.99 at the beginning of the event, but eventually raise to $35.99. 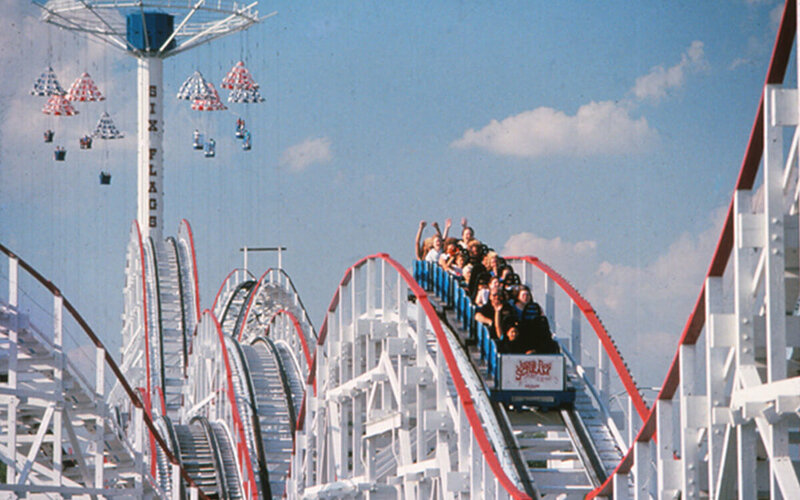 Six Flags Over Texas ends the season on January 1, 2006. At the end of the season USA Gifts, Soft Frozen Lemonade, Lone Star Wax Works, & the DC Superheroes store are removed from the park. At the end of the season, Turbo Bungy and Texas Cliffhanger (rock wall) are removed from the Tower section of the park. Gotham City Spray Ground was a water attraction added to Gotham City. Judge Roy Scream undergoes major retracking and is repainted with white supports and white track. The Texas Giant receives new air gates and the transfer track of the ride is reconstructed. Six Flags Over Texas begins the 2006 season on March 4, 2006 with adult tickets at $45.00, children tickets (under 48") at $35.00, season passes at $75.00, family 4 pack (per pass) $65.00, parking season pass at $50.00, and daily parking at $15.00, celebrating the park's 45th anniversary in operation. 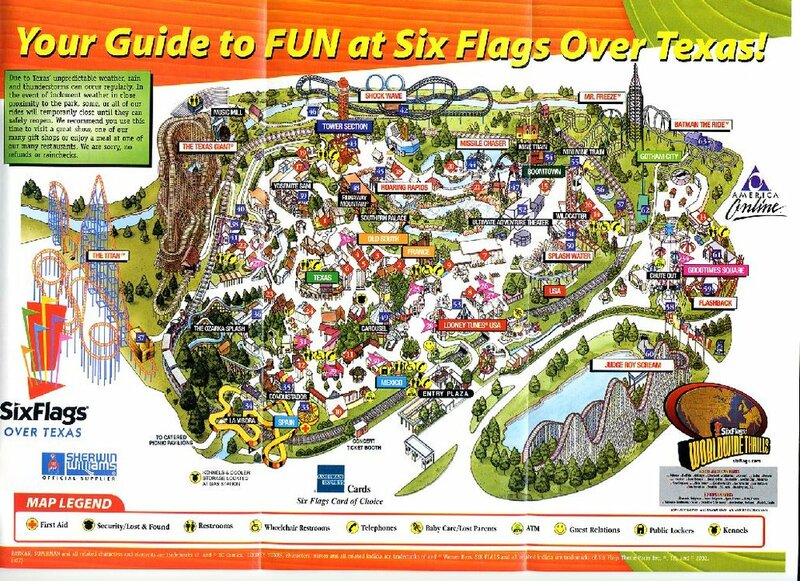 10 new rides and attractions are introduced at Six Flags Over Texas in the spring of 2006: ACME Rock-N-Rocket, Batwing, Boot Scootin', Caddo Lake Barge, Cloud Bouncer, Crazy Legs, Gotham City Sprayground, La Fiesta De Las Tazas, Rodeo, and Sidewinder. El Sombrero reopens in the area of Mexico once occupied by the patio of Bandera's Mexican Restaurante. The Ozarka Splash (log flume attractions) are renamed El Aserradero. Fastlane is renamed to Flash Pass, themed after Justice League character The Flash. Brunch With Bugs, Texas Star Tours, and a nightly parade are introduced at the beginning of the season. Texas Tornado is rethemed and renamed Gunslinger. On July 19 a fire breaks out at the Majestic Theater. No major damage or injuries occur. 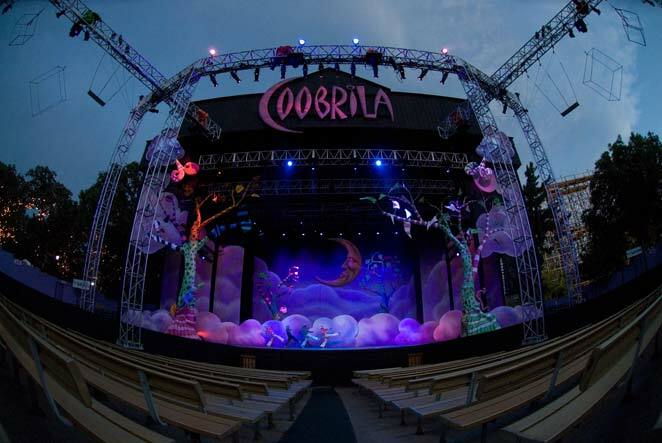 During the summer Six Flags announces that the 2007 season will bring later hours, more bands, and a brand new nightly show in the Music Mill Amphitheater called Coobrila. Other summer shows include Xtreme Country in Southern Palace Theatre, Funk Nation in Majestic Theatre, and Showboat's Comin' in Crazy Horse Saloon. At the end of the season, Mr. Freeze is repainted from light blue track and supports to red track and blue supports. Music Mill Amphitheater is repained and receives various upgrades for next year's summer show Coobrila. The operating season ends on January 2, 2007. Panda Express replaces East Texas BBQ in the Texas section of the park. Cold Stone Limited replaces Chuckwagon Grill in the Tower section of the park. Johnny Rockets replaces Chubbie's Diner in the Goodtimes Square section of the park. Crazy Legs is almost completely rebuilt. The 2007 season begins on March 10, 2007 with adult tickets priced at $47, children tickets (under 48") at $34.99, 2 and under are free, and guests with disabilities is $34.99. Season passes are priced at $79.99, Texas Gold Passport priced at $99, and season pass parking is priced at $50. VIP Tours are priced at $199. Splash Water is rethemed and renamed to Aquaman Splashdown after the character Aquaman from the Justice League. Summer operating hours are extended to 11pm. Cirque Dreams Coobrila comes to the revamped Music Mill Ampitheater as an evening show during the summer. During October the Wildcatter attraction is imploded and removed. The operating season ends on January 2nd, 2008. At the end of the season, Bumper Cars and Spongebob Squarepants 4D are removed from the park. Casa Magnetica ceases operation. Crews constructing Tony Hawk's Big Spin in early 2008. The 2008 season begins on March 1, 2008. Batman: The Ride is repainted with yellow track and midnight blue supports. The high speed turn around of Shock Wave is retracked during the spring. Before the season begins, USA Stage is permanently removed from the USA section of the park. Tony Hawk's Big Spin, a spinning steel coaster, is constructed and opened in the former location of Wildcatter. The 2008 season ends on December 28th, 2008. The 2009 season begins on March 7, 2009. Six Flags Over Texas unveils a brand new nightly parade concept called the Glow in the Park Parade. The parade operates during summer months. Summer shows include Country is my Rock in Southern Palace Theatre and Big Time Revue in Crazy Horse Saloon. The Fright Fest show line-up includes Welcome to Arania's Nightmare in Southern Palace Theatre, Howl in Majestic Theatre, and Final Freak Out at Silver Star Carousel Stage. The 2009 season ends on January 2, 2010. The 2010 season begins on March 6, 2010. The Texas Giant is closed during the season as the transformation into a hybrid roller coaster begins. The Glow in the Park Parade runs through the summer and does not return after 2010. The 2010 season ends on January 2, 2011. New Texas Giant is the first-ever hybrid coaster in the world. The 2011 season begins on March 5, 2011. The New Texas Giant reopens to the public as a brand new hybrid roller coaster on April 22. The summer show line-up includes Chart Toppers in Southern Palace Theatre, Big Time Revue in Crazy Horse Saloon, and Celebrate Texas at Silver Star Carousel Stage. The park celebrates its 50th anniversary on August 5, 2011. The 2011 season ends on January 1, 2012. The 2012 season begins on March 3, 2012. At the beginning of the season, Mr. Freeze: Reverse Blast debuts. The trains are flipped backwards for operation. The show line-up for Fright Fest includes Welcome to Arania's Nightmare in Southern Palace Theatre, Howl in Majestic Theatre, Dead Man's Party, and Final Freak Out at the Silver Star Carousel Stage. The show line-up for Holiday in the Park includes Deck the Halls in Lone Star Theatre, All I Want for Christmas in Southern Palace Theatre, Honky Tonk Christmas in Crazy Horse Saloon, and Jolly Holiday at Silver Star Carousel Stage. Flashback! is closed permanently on September 3, removed from the park, and relocated to Six Flags St. Louis. Texas Chute Out is also closed on September 3 and imploded in October. The 2012 season ends on January 6, 2013. Texas SkyScreamer was the tallest ride of its kind in the world when it debuted. The 2013 season begins on March 2, 2013. Texas SkyScreamer, a Funtime Star Flyer attraction, opens in the location that was once occupied by Texas Chute Out. The summer show line-up includes Chart Toppers in Southern Palace Theatre, Country Young Gunz in Majestic Theatre, and Miss Ruby's Wild West Cabaret in Crazy Horse Saloon. The 2013 season ends on January 5, 2014. Daffy Duck Bucket Blasters is added during the Bugs Bunny Boomtown expansion/remodel. The 2014 season begins on March 1, 2014. Bugs Bunny Boomtown, located in the park's USA section, opens as a complete remodeling and expansion of the children's area once known as Looney Tunes USA. Ride removals include Bugs Bunny's Spirit of St. Louie, Daffy Duck's Capitol Tours, Michigan J. Frog's Tinseltown Revue, and Route 66 Bumper Cars. New Bugs Bunny Boomtown attractions include Marvin the Martian Space Rockets, Taz Tornado Swings, Daffy Duck Bucket Blasters, and a playground. Taz's New York Adventure is also moved to a new location within the children's area and renamed Bugs Bunny Cloud Bouncer. All other existing attractions remain. Adventure Theater begins undergoing a remodeling and expansion, leaving Roaring Rapids closed all season. ACME Rock-N-Rocket is removed from the park at the end of the season. The 2014 season ends on January 4, 2015. Justice League: Battle for Metropolis now sits in the former Adventure Theater building. The 2015 season begins on March 7, 2015. Justice League: Battle For Metropolis opens in the USA section in the building that once used to house Adventure Theater. The summer show line-up includes Chart Toppers in Southern Palace Theatre, Country Young Gunzin Majestic Theatre, and Miss Ruby's Wild West Cabaret in Crazy Horse Saloon. The show line-up for Fright Fest includes Welcome to Arania's Nightmare in Southern Palace Theatre, Dead Man's Party, and Final Freak Out at the Silver Star Carousel Stage. The show line-up for Holiday in the Park includes All I Want for Christmas in Southern Palace Theatre, Honky Tonk Christmas in Crazy Horse Saloon, and Jolly Holiday at Silver Star Carousel Stage. The 2015 season ends on January 3, 2016. 2016 saw the addition of two new attractions, including The Riddler Revenge. The 55th season of operation begins on March 5th, 2016. Single day tickets start at $72.99 in-park and $52.99 online. Season passes are as low as $64.00. Daily parking costs $20. A dining pass starts at $84.99. The Bumper Cars building is demolished to make way for a Gotham City expansion. Gotham City is expanded into existing Goodtimes Square section of the park. Two new flat rides are added to the park: Catwoman Whip resides in the old Bumper Cars location and The Riddler Revenge resides in the old Flashback! location. During the summer a new outdoor performance venue, Gotham City Stage, is added to Gotham City. Casa de las Banderas, a "sports bar" restaurant opens in the summer in the Mexico section. A previous restaurant, with the same name and location, operated here a number of seasons prior. Fright Fest runs from September 24 through October 31. The show line-up includes Welcome to Arania's Nightmare in Southern Palace Theatre, Dead Man's Party, and Final Freak Out at the Silver Star Carousel Stage. The event also includes seven scare zones and five haunted houses. Holiday in the Park runs from November 19 through January 2. The show line-up includes All I Want for Christmas in Southern Palace Theatre, Honky Tonk Christmas in Crazy Horse Saloon, and A Jolly Holiday at Silver Star Carousel Stage. Also new for the event is Deep in the Heart of Christmas, a brand new Christmas light display in Boomtown which features over 8 miles of lights. Demolition of an old shopping strip on the corner of the property begins in November (behind Batman: The Ride). Construction quickly begins and progresses on The Joker in November and December, a new roller coaster slated for the 2017 season. An early look at the construction progress of The Joker. The 2017 season begins on February 25, 2017. The Joker, a S&S 4D steel coaster, is added to the Gotham City section of the park. The ride opens to the public on May 20 with a soft opening from May 16 through 19. Gotham City undergoes another expansion with the addition of The Joker. A new gift shop called Fun House Gifts is added to Gotham City with the opening of The Joker. Major repainting takes place on various structures throughout the park, mostly impacting Texas and Tower sections. The summer show line-up includes Chart Toppers: Ovation in Southern Palace Theatre, Country Young Gunz in Majestic Theatre, and Miss Ruby's Wild West Cabaret in Crazy Horse Saloon. Two new food stands called Casa de Churros and Strutters Express are added to Gotham City in late summer. In late August, the park announces a brand new ride coming to Gotham City in 2018 called Harley Quinn Spinsanity. Fright Fest runs from September 23 through October 31. Live entertainment includes Welcome to Arania's Nightmare in Southern Palace Theatre, Dead Man's Party at Gotham City Stage & Silver Star Carousel Stage, and Goblin Attack Squad (New) at Gotham City. The event also includes five haunted houses and six scare zones. Holiday in the Park operates from November 17 through January 7. The show line-up includes All I Want for Christmas in Southern Palace Theatre and A Jolly Holiday at the Silver Star Carousel Stage. Also new for 2018 was the Merry Marketplace and Santa's Outpost in the Texas section. Harley Quinn Spinsanity is the second ride of its kind installed in North America. Oil Derrick is repainted the same color - International Orange. The attraction's elevator system is also refurbished. The park's original Harley Quinn Spinsanity (formerly known as Crazy Legs) is removed during the off-season. The Boomtown Arcade is demolished during the off-season. The 2018 season begins on February 24, 2018. The bathroom facilities outside of Front Gate are remodeled. The interior of Looney Tunes Mall is remodeled. A moving station is added to Pandemonium to increase hourly throughput and efficiency. Texas Taco Bar replaces Go Fresh Cafe in the park's Texas section. Oliver's Tavern replaces Cold Stone Limited in the park's Tower section. Coaster Candy replaces Jelly Belly in the park's USA section. The summer show line-up includes the all-new Hey Mr. DJ: Technicolor Beat in Southern Palace, Miss Ruby's Wild West Cabaret in Crazy Horse Saloon, and Texas Justice at the Court House Stage. July 4th Fest, an event featuring a food festival, nightly fireworks show, and foam after party, operates from June 30 through July 4. Harley Quinn Spinsanity officially opens to the public on July 14 with a soft opening from July 11 through July 13. On August 30, the park announces that a brand new attraction, Lone Star Revolution, will be added to the park in 2019. Fright Fest operates from September 22 through October 31. The entertainment line-up includes Welcome to Arania's Nightmare in Southern Palace Theatre, Dead Man's Party, and The Awakening. A new haunted house, Hell Block 6, is introduced in the Gotham City section. Two new scare zones, Anarchy Unleashed (Gotham City section) and Squeal Long Pig (Texas section), are introduced. The event provides a total of six haunted houses and four scare zones. Ma Hunkel’s Famous Chicken, a new restaurant in Gotham City, opens with Fright Fest. Panda Express permanently closes in September. Holiday in the Park operates from November 16 through December 30. The entertainment line-up includes All I Want for Christmas in Southern Palace Theatre, The Holiday Hams at Court House Stage, and A Jolly Holiday at the Silver Star Carousel Stage. In December the park introduces a Flash Pass watch device known as the accesso Prism. This device replaces the former Qbot Flash Pass system. Mr. Freeze receives a third train in December from the former Batman & Robin: The Chiller roller coaster that operated at Six Flags Great Adventure from 1998 until 2007. The 2018 season ends on January 6, 2019. El Diablo is coming to the park in 2019. On January 22, it is announced that Lone Star Revolution, the park's 2019 ride addition, will instead be named El Diablo and constructed in the Spain section. The 2019 season begins on February 23. In March, Smith Street Ice Cream Parlor, a new dining option, opens in the park's Old South section. The Texas Gifts gift shop also reopens in the park's Texas section. McCown, Davis. Six Flags Timeline | Parktimes. parktimes.com/pxcontent/timeline. Accessed 19 Feb. 2006. Mosier, Jeff. “Six Flags Over Texas Started Distancing from the Confederate Battle Flag Decades Ago.” Dallas News, 30 Aug. 2015, www.dallasnews.com/news/news/2017/08/17/six-flags-over-texas-started-distancing-from-the-confederate-battle-flag-decades-ago.